Background: In women, changes in estrogen levels may increase the incidence and/or symptomatology of depression and affect the response to antidepressant treatments. Estrogen therapy in females may provide some mood benefits as a single treatment or might augment clinical response to antidepressants that inhibit serotonin reuptake. Objective: We analyzed the mechanisms of estradiol action involved in the regulation of gene expression that modulates serotonin neurotransmission implicated in depression. Method: Publications were identified by a literature search on PubMed. Results: The participation of estradiol in depression may include regulation of the expression of tryptophan hydroxylase-2, monoamine oxidase A and B, serotonin transporter and serotonin-1A receptor. This effect is mediated by estradiol binding to intracellular estrogen receptor that interacts with estrogen response elements in the promoter sequences of tryptophan hydroxylase-2, serotonin transporter and monoamine oxidase-B. In addition to directly binding deoxyribonucleic acid, estrogen receptor can tether to other transcription factors, including activator protein 1, specificity protein 1, CCAAT/enhancer binding protein β and nuclear factor kappa B to regulate gene promoters that lack estrogen response elements, such as monoamine oxidase-A and serotonin 1A receptor. Conclusion: Estradiol increases tryptophan hydroxylase-2 and serotonin transporter expression and decreases the expression of serotonin 1A receptor and monoamine oxidase A and B through the interaction with its intracellular receptors. 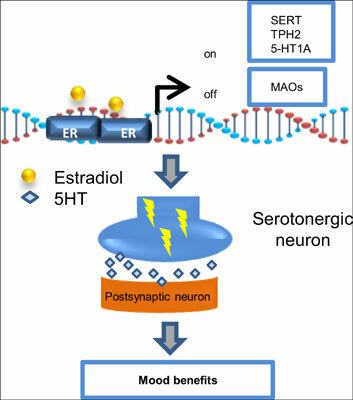 The understanding of molecular mechanisms of estradiol regulation on the protein expression that modulates serotonin neurotransmission will be helpful for the development of new and more effective treatment for women with depression. Depression, estradiol, monoamine oxidases, serotonin transporter, serotonin 1A receptor, tryptophan hydroxylase.